The University of Lynchburg community lost a scholar, teacher, mentor, and coach on Monday, August 28, with the death of Dr. James L. Owens. A memorial service will be held Friday, September 29, at 3 p.m. in Snidow Chapel. For nearly 50 years, Dr. Owens dedicated his life to teaching history at University of Lynchburg. He was one of the professors alumni sought out the most when visiting campus, and he received the Honorary Alumnus award in 2010. Dr. Owens came to University of Lynchburg in 1969. The following year, he and Dr. Sigler began coaching the swim team while the swim coach took a sabbatical. Dr. Owens later volunteered to coach the water polo club team for many years. Dr. Owens made a mark on the College’s academic life, including the development of an introductory history course that helped students prepare for historical research. Dr. Owens was a founding member of University of Lynchburg’s chapters of the honor societies Phi Kappa Phi and Phi Alpha Theta. 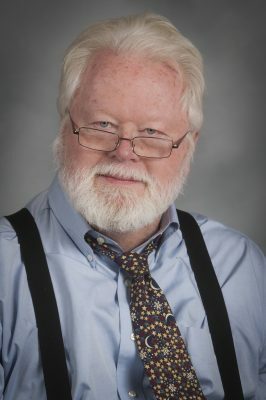 Nichols recalled a final exam that required his group of three to work together for about nine hours and write 30 pages to respond to a complex question. Although it was difficult, the experience taught him to be diligent and avoid cutting corners — lessons that Nichols needed in his Navy service and in running his own business.